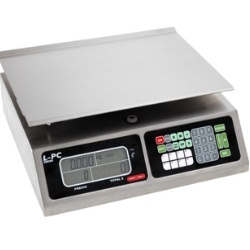 The Tor-rey L-PC-40L is an invaluable scale for smaller markets, delis, grocery stores, butcher shops and bakeries, and is very popular at farmers markets thanks to its portability. Featuring an AC adapter and built-in rechargeable battery, this scale will meet virtually any weighing need in a variety of settings. NTEP legal for trade 40 x 0.01 lbs. We used to sell quite a few of these scales but over the past few years we have found other brands that offer a similar price and much better factory support.